As part of Yahoo! Singapore's coverage of the 2011 General Elections, we speak to new faces to look out for in the coming weeks. In the third of a four-part series, ALICIA WONG and FARIS MOKHTAR speak to Tony Tan, Hazel Poa and Jeanette Chong-Aruldoss of the National Solidarity Party. She describes him as "driven" and "goal-oriented", in contrast to her focus on making sure the "journey we embark on is enjoyable and meaningful". He describes her as a "people-person". But it is such differences that make National Solidarity Party's (NSP) husband-and-wife team, Tony Tan and Hazel Poa, both 41, complement each other. The chatty couple met in Cambridge University and have been married for over 20 years. Last year, both made their foray into opposition politics by first joining the Reform Party, and later the NSP. In an hour-long interview with Yahoo! Singapore, the former government scholars -- Tan studied engineering on a Singapore Armed Forces Merit scholarship while Poa studied mathematics on a Public Service Commission scholarship -- shared issues that fired them up and what they hope to achieve by contesting in the coming General Election (GE). The role of the opposition, said Tan, is to air people's concerns through a "bottom up approach" and to balance the government's "top down approach". He stressed repeatedly that their main focus is not to win the GE, but seek to encourage others, through their example, to share ideas and debate publicly. When asked why they decided to leave the government service, Poa said, "Having it (debates) within one party, whatever disagreements, debates they have, it's under wraps. They keep it among themselves and when they come out it's one united front. So the public never gets to see all these debates." Poa worked in the Administrative service for four years in the 1990s, her last-held position was that of an assistant director in the Finance Ministry. Tan left the SAF in 2001 after his eight-year bond ended. He was a major, and served in a combat unit and in the Defence Ministry. "There are many people like us in the establishment," she added. By joining the opposition, they add more value by helping to create a stronger alternative. The couple have been going on walkabouts for at least two to three hours each day, to gain an understanding of residents' needs. Poa pointed out that Singaporeans are concerned about bread and butter issues. What people are asking for "is an environment where if they put in work, they are able to live life comfortable and with dignity". At a time of globalisation and increasing competition from other countries, there is an urgent need for the government and citizens to forge a common vision, said Tan. "The vision for Singapore is not very clear, or maybe I'm not very clear," he said. "It looks to me that the (government) vision is to double the GDP in the next 10 years". "I don't know if that is very exciting to the leaders, or to the population. As Singaporeans, we need to have a common vision," he said. To do so, the government needs to better communicate with people, he said. People know the "broad-stroke argument", but there must be greater detail in explaining policy decisions and rationale, sharing worries and offering alternative solutions. Tan also called for more public debate on policy ideas and for more scrutiny on how they are implemented. For Poa, education is an area that hits close to home since the couple runs a chain of 10 tuition centres called SmartLab, which they founded in 1999. She feels strongly about the need for more diversity in the education system from the primary school level as these are the formative years for children. Taking reference from the Finland model in which students study from the primary to secondary levels without a national exam, she said that Singapore could adopt a similar model by eventually phasing out the Primary School Leaving Examinations. In that way, students could explore more areas of interest without worrying if it would affect their exam results. This would also apply for students at the upper levels. For example, providing opportunities for a student studying physics in a reputable school to also take a course on motorcycle repair in the Institute of Technical Education. "You want that kind of cross-fertilisation to make sure you fully develop people in accordance to their potential and interests," he said. The couple, who have two sons aged 4 and 5, said they would be open to allow their children to take a year off studying to work or embark on less traditional education routes. While they currently lead a comfortable life, the couple shared that it was not always so. Both individuals had come from low-income backgrounds and had to find ways to scrimp and save from a young age. Said Poa, "These are things we can empathise with ... perhaps there are still things we don't understand but we can listen and we can empathise." Should Singapore continue with the ruling People's Action Party mantra of "cheaper, better, faster", citizens could end up with a country that is "cold and calculative," warned NSP candidate Jeannette Chong-Aruldoss, who is a lawyer by profession. The 48-year-old new face wants to see a vibrant and diverse Singapore that boasts strong bonds between citizens, friends and families. She shared her plans to promote such ideals in Mountbatten single member constituency, where she is slated to contest in the coming GE. "I envision Mountbatten to be a community of engaged and active citizens who have deep ties with their neighbourhood and are alive to their role as stakeholders of our nation," she told Yahoo! Singapore. "If elected, I will promote ownership of issues by engaging all constituents, and that includes the youth in the decision-making process," said Chong-Aruldoss, who spent her childhood years in Mountbatten. The mother of four joined politics in June 2009, when her children were older. She was also among the 20 or so members who resigned from the Reform Party. 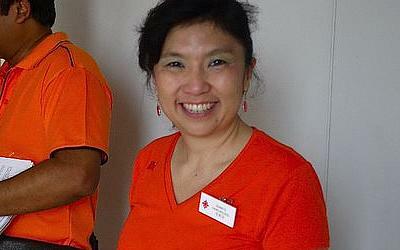 Chong-Aruldoss explained her decision to join the opposition as wanting to provide an "alternative voice". "If a minister wants to propose a law, it's good to have a good debate. And if there are 82 out of 84 seats belonging to one party, I worry that new laws are not properly explored," she said.